Florida has more than 42,000 healthcare facilities, and the Agency for Health Care Administration (AHCA) projects that construction work in this sector will triple in the next five years. But, because of tight budgets, more providers opt for remodeling instead of building new, and that shift creates new challenges and serious risks. Thousands of patients fall victim every year to infections caused by dust stirred-up during renovation projects. Inadequate procedures at the jobsite can release contaminants trapped above ceilings, behind walls or under floors, allowing them to infiltrate patient and staff environments via HVAC systems, foot traffic, and other conduits. About 100,000 people die each year in the USA from healthcare facility-acquired infections, and medical costs to battle the illness hovers around $45 billion a year, according to the U.S. Centers for Disease Control and Prevention. Florida carpenters are addressing this problem by elevating training. We’ve created a typical health facility mockup that reflects real-time working conditions of a medical center. This real-time prop mimics patient rooms, labs, exam rooms, waiting rooms, and other venues found in a healthcare facility. The foundation of our training is the UBC’s proprietary and industry-heralded Construction ICRA: Best Practices in Healthcare Construction program. The curriculum was developed with leading construction-related infection control experts around the country. Study focuses on how to remain productive within construction ICRA protocols via combined hands-on, classroom, and simulation training. Florida Carpenters trained in this program have superior skills needed work safely without disrupting operations — all while keeping a project on budget and on schedule. 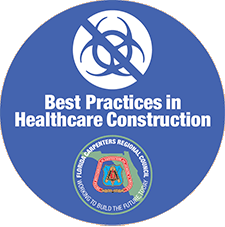 When a Florida carpenter successfully completes the 24-hours of coursework and testing, he or she earns two qualification cards: Best Practices in Healthcare Construction and Blood-Borne Pathogens. Maintaining the Best Practices credentials requires ongoing refresher courses and re-certification every four years. Maintaining the blood borne pathogens Qualification Card requires annual re-certification. Our relationships with contractors and health-facility owners enable us to also offer an 8-hour awareness course for healthcare workers and other skilled trades, so they, too, understand construction ICRA. 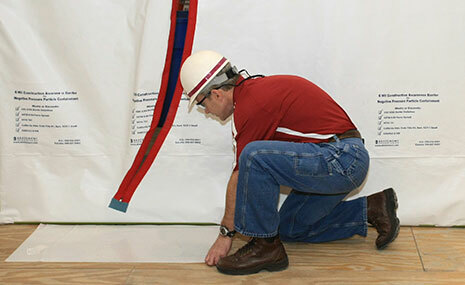 We envision a total construction team effort to meet and exceed construction ICRA standards. All of this training is active and ongoing here in the Florida Carpenters Regional Council. 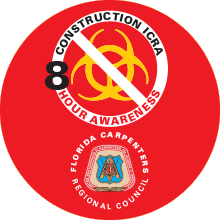 For more information or to get a list of Florida contractors who hire ICRA-trained carpenters, contact us. Describe why healthcare facilities are unique work environments and why extra precautions must be taken while working in them. Explain the functions and responsibilities of the ICRA team and how the ICRA form is used to determine a work area classification. Explain the differences between positive, equal, and negative air pressure and how air pressure affects contaminants. Recognize how airborne contaminants are isolated and controlled. Describe the work practice procedures used in a healthcare facility. Identify the agencies and organizations that oversee healthcare facilities. Identify the different types of barriers and the purpose of each. 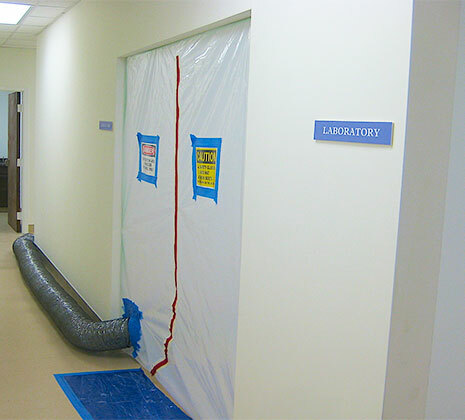 Describe the four methods used for mold remediation and a list of PPE and work practices needed for mold remediation in a healthcare facility. 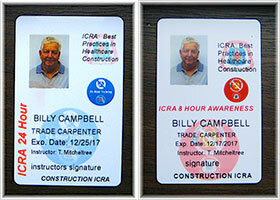 A blue badge, specifically designed for the Florida carpenter, is worn to quickly identify a carpenter who has been properly trained in 24-hour Construction ICRA protocol. A separate red badge ID’s the 8-hour trained individual. Expiration dates of training gives supervisors a quick look at who is current and who is nearing re-training status. Learn more about our Construction ICRA program.